“How can a young person stay on the path of purity? By living according to your word” (Psalm 119:9 NIV). In a culture that is absolutely obsessed with appearance and image, how in the world do you keep it real when everybody else is faking it? They don’t have integrity. They’re scooting by and they’re skimming and they’re cheating. They’re not keeping their promises. There’s only one way. You’ve got to care more about God’s approval than the approval of other people. That’s the only way you’ll ever become a person of integrity. Because if you care about what God thinks, then you’re going to do the right thing. If you care more about what other people think, you’re often going to do the wrong thing. Psalm 119:9 says, “How can a young person stay on the path of purity? By living according to your word” (NIV). The only way you’re going to know what God approves of and what he thinks of you is by reading the Bible. You must stay in God’s Word! If you don’t, you won’t have the strength and the stamina to live with integrity. If I don’t have a daily quiet time with God in the Word, if I miss it for even a few days, I notice it — everyone notices it! — because I start getting cranky. If I don’t stay connected to God through his Word, I would not have any spiritual power to clearly explain the Word of God to you. I would not have the strength to live with integrity. Living with integrity takes spiritual power, because what is right is often unpopular. You’re going to get tired trying to do the right thing and be real and keep the right motives, and you need to be equipped and refreshed. You do that by reading and studying the Bible, God’s Word. How does reading God’s Word give you strength? Why is it beneficial to memorize Scripture? What are some of God’s promises from the Bible that can encourage you when you need to make the right but unpopular choice? Each day, you have to make important life choices—How am I going to think, speak, and act? Many people struggle with making the best choices—because they’re taking their cues from the wrong people and living by values that are at odds with God’s values. Pastor Rick Warren shares the practical advice you need to make life-giving moral choices in his complete audio series, Building My Life on Values That Last. 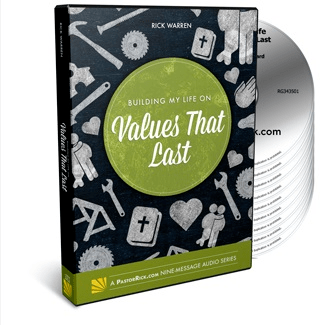 The Building My Life on Values That Last complete audio series is available as boxed 9-CD set or by high quality MP3 and it’s our gift to thank you for your donation today to help more people learn, love, and live the Word with Daily Hope. So please request your copy it when you give today. May this resource help you make life-changing choices and embrace a new future of hope!